A pioneer and expert in in CIO and Senior Technology Executive careers and job search, Kim is known for her depth of understanding of the function and business of today's technology executives. She, herself, has a technology background and Fortune 50 experience in business. In addition, she has years of expertise partnering with technology executives to propel their careers upward and onward - swiftly. With 20+ years in the careers industry, bringing innovative ideas, sharing with, and training others, Kim is known as a leader and has been frequently called upon to present and write for the industry. For delivery of outstanding results, Kim is consistently rated 10 out of 10 by her clients. Read testimonials on this site and on her LinkedIn profile to see for yourself. 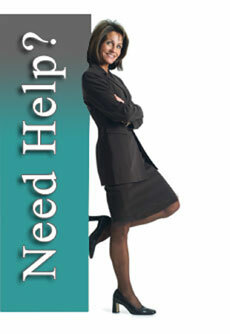 Seeking out professional assistance and finding you was one of the things I did right. Kim was great to work with...I enjoyed the entire process. Known internationally as "The CIO Coach" for 17+ years, Kim specializes in assisting Senior Technology Executives - CIOs, CTOs, CDOs, VPs, Directors - in powerfully positioning their unique value to corporate decision-makers, outdistancing the competition and accelerating careers or job search, while 'making their mark' on their companies and organizations. Kim's clients include many CIO 100 Award Honorees and top C-level executives from some of the world's leading companies. Kim coaches today's top technology leaders with outstanding results. Her clients land into new positions 300% faster than their peers. The first career coach to bring to the market a highly effective personal branding process exclusively for technology executives, she coaches leaders in self-marketing and communication techniques, executive resume and portfolio writing, job search strategies, Linked Profiles and other social media career marketing, interview techniques, salary negotiations, leadership and talent management, and job or career transformation. 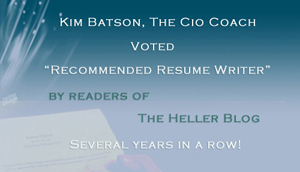 Resumes, Executive Bios, Letters of Introduction, and LinkedIn Profiles created by Kim's company are known as 'the best of the best'; they are stunning, powerful and effective. Recognized for outstanding communication, presentation, and relational skills, Kim is a dynamic keynote conference speaker and writer on career-related topics. She is a member of the C-Suite Career Catalyst group, International Coach Federation (ICF), National Resume Writers Association (NRWA), Career Directors International (CDI) Christian Coaches Network (CCN) and Women In Technology International (WITI). "Kim was one of the highest rated speakers at our conference. The information and insight she presented on how IT executives need to build a personal brand was thought provoking and inspiring, and her deep experience in the field and top notch presentation skills sealed her popularity with the audience. I'd recommend her for any technology executive engagement." 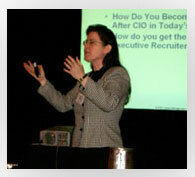 - Anne McCrory, Conference Chair, CIO Decisions Conference, Editor-in-Chief, CIO Decisions Magazine. "Kim Batson is a highly talented and extremely knowledgeable speaker who is able to fully captivate an audience with her enthusiasm, and rivet their attention on the subject at hand. She radiates such a positive attitude that she is able to easily take charge and have the crowd involved and excited about the topic and she is able to make them more open and willing to learn. I have enjoyed watching her speak and found that the time passed so quickly, the session was up before I was ready to leave! I think I could have easily listened to her for another 2 hours. I also know that Kim radiates this same enthusiasm, professionalism, and solid knowledge about her subjects even when she is not in front of a crowd. I consider her a true gem and would travel many miles, if necessary to hear her speak again." - Tracy M. Parish, CPRW, President / CareerPlan, Inc.
"Kim personally engages her audiences with a vibrant and welcoming presentation style. She seamlessly weaves theory, stories, case studies, and interactive activities with practical applications that elevates participant learning. Kim truly lives her brand of delivering "Innovative Career and Communication Strategies." - Murray A. Mann, President, Global Strategies Group and Co-Author, Barron's The Complete Job Search Guide for Latinos. 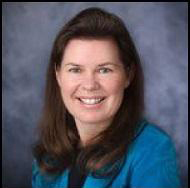 Selected as an original Executive Coach and Resume Expert for NETSHARE.com, voted Best of Forbes and Fortune magazines for executive job search, Kim is also a member of the C-Suite Career Catalysts, (http://c-suitecareercatalysts.com/cio-coach/kim-batson/) and a Member Advisor on Technology Executives and Professionals the National Resume Writers Association. She is also a frequent contributor to leading industry print and web media, and has been featured in the Wall St Journal, CIO magazine, Computerworld, CIO Decisions Magazine, Techtarget, SearchCIO.com, The Heller Blog, Processor Magazine, Monster.com, ECN, and many others. Want to accelerate your career or job search? Connect with Kim on Twitter, Facebook and Google+. Read Kim's blog posts and articles. Kim Batson has been known as The CIO Coach for 17+ years, accelerating CIO Executive Careers and Job Search through innovative Career and Communication Strategies. Copyright 2000-2018. 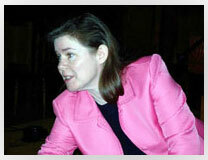 Kim Batson,The CIO Coach. All Rights Reserved.